Overview - Enormously wealthy and emotionally remote investment banker Nicholas Van Orton (Michael Douglas) receives a strange gift from his ne’er-do-well younger brother (Sean Penn) on his forty-eighth birthday: a voucher for a game that, if he agrees to play it, will change his life. Thus begins a trip down a rabbit hole that is puzzling, terrifying, and exhilarating for Nicholas and viewer alike. This multilayered, noirish descent into one man’s personal hell is also a surreal, metacinematic journey that, two years after the phenomenon Se7en, further demonstrated that director David Fincher was one of Hollywood’s true contemporary visionaries. At one point in David Fincher's 'The Game,' Nicholas Van Orton (Michael Douglas) finds himself in the home of a mysterious woman. When she briefly exits the room, he starts to examine his surroundings, and slowly realizes that the entire house is actually nothing more than a facade. The lamp still has a price tag, the family photographs are just magazine clippings, the books on the shelves are hollowed out, and the water doesn't even run. It's all a lie. A fabrication. In a rare instance of cinematic transparency, the room is almost exactly what it actually is -- a film set. You see, Van Orton is in the middle of a carefully plotted game complete with props, stunts, and actors… and so are we. As the unseen masters of Nicholas' meticulously designed torment twist and contort him in various directions, so too does Fincher guide and maneuver his audience, weaving an intelligent, multilayered thriller about control and manipulation. A dark, faintly meta exercise in suspenseful filmmaking, the movie constantly forces its viewers to question what's real, taking them through a gleefully twirling narrative full of deception and intrigue. Nicholas Van Orton (Michael Douglas) is a wealthy but cold investment banker. Isolated and strictly focused on business, Van Orton has become emotionally detached and rarely detours from his typical, controlled routine. When his unruly younger brother, Conrad (Sean Penn), makes a surprise visit, he gives Nicholas a very unique birthday present -- a "game" from the enigmatic CRS company that promises to offer an experience like no other. Suddenly, Van Orton is thrust into a complicated, dangerous mystery, and while it's just supposed to be an elaborate thrill-ride, the threats seem all too real. As his descent down the rabbit hole grows increasingly deadly, he becomes unsure what's real and what's not, and realizes that the cost of losing this game, might be his life. In the included commentary, Fincher describes the film as "a movie about movies" and in many ways that's exactly what it is. As Van Orton's game begins, he slowly finds himself within his own personal, specially designed Hitchcockian mystery. A complex production full of twists and turns, the "game" narrative that the character is forced to follow seemingly adheres to various conventions of the suspense genre. Cryptic clues are left along with special tools and items that Van Orton will need to figure out how to use, guiding him through a classic noir influenced story that has been tailor made for him alone. A growing conspiracy unfolds with red herring after red herring, and there's even a seemingly innocent woman who might actually be a conniving femme fatale. Of course, these standard plot points are all turned upside down, deconstructed, and then reformed into something new yet still familiar. Throughout his journey Van Orton is subjected to a series of dark and occasionally surreal challenges that all rely on a kind of heightened cinematic logic, creating layers of slightly metafictional subtext. The movie is often criticized for being unrealistic, but in reality, most of the elaborately orchestrated situations that Van Orton is subjected to are all within the realm of possibility. After all, the filmmakers manage to pull them off just fine. If the perils Van Orton faces actually end up being nothing more than high-octane entertainment, it's conceivable that the guns are filled with blanks, the rooms are littered with exploding squibs, the car crashes are merely controlled stunts, and the scenarios themselves are just heavily scripted. In its own way, the game is literally a movie within a movie, and CRS simultaneously uses the exact same tools and techniques that Fincher does, manipulating Van Orton in the same manner that directors manipulate us. It's actually a rather fascinating dichotomy, cleverly blurring the line between reality and fiction. Of course, even when keeping this relationship in mind, some of the film's situations are still a bit ridiculous and certain plot points don't completely hold up under scrutiny. While the very existence of the movie makes it clear that everything we see can indeed be faked to look real, the filmmakers have far fewer variables to contend with than CRS does, and Fincher has the added benefits of editing and CG at his disposal. Still, as the director points out in the commentary, this isn't meant to be a firm representation of reality, and by using cinematic logic as a prominent element of the actual narrative, the movie aims to not only weave a genuinely thrilling mystery, but also a clever commentary on the conventions and techniques of the medium itself. The concepts of control and manipulation play heavily into the thematic backbone of the script, and Van Orton's story presents a classic Scrooge-esque journey of growth. Though he starts out as a manipulative control freak, the character gradually loses power, and soon it's Nicholas himself who is being helplessly manipulated and controlled. Michael Douglas does a fantastic job of carrying the film, and completely sells Van Orton's slow descent into paranoia and uncertainty. He's completely at odds with the film-like world he's forced into, and his struggle to survive and discover the truth is utterly compelling and engrossing. With a lesser performer, the movie's plot heavy focus could have easily swallowed up the runtime, but Douglas manages to maintain a strong emotional center. The character's arc is well executed and the payoff to his hellish ordeal is satisfying and appropriately open ended. Moody and drenched in shades of noirish gloom, the movie features a strong, calculated sense of style. Fincher employs many of his trademark visual touches, creating a stark air of paranoia and intrigue. Frequent wide shots are used to enhance the character's isolated existence and slow camera movements help to create an unsettling sense of atmosphere. One scene even features some slow motion POV shots of various, random pedestrians, placing us squarely within Van Orton's increasingly suspicious state of mind. Through Fincher's distrustful lens, anyone could be a potential threat. In the included commentary, the director also discusses his desire to avoid too many overbearing close-ups, instead allowing the audience to decide what's important for themselves. The mystery is allowed to unfold naturally, but one never loses sight of the director's carefully orchestrated choices. Fincher keeps the pace steady but methodical, creating a strong aura of tension and suspense. This all adds up to a remarkably assured cinematic tone, that shows a director completely in control of his craft. With its winding, maze-like plot and very loose deconstruction of genre conventions and filmmaking techniques, 'The Game' is a thrilling ride that also happens to be a deeply layered commentary on psychological and cinematic manipulation. Fincher and CRS are both directors in their own right, and just as Nicholas Van Orton is thrown down the rabbit hole, so too is the audience thrust into a surreal kaleidoscope of Hitchcockian suspense. The relationship between reality and illusion is distorted, and though certain elements of the plot might be a bit ridiculous, the director manages to employ such a refined, commanding sense of style and tone, that all the elements seem to fit together perfectly like a jigsaw puzzle -- even if it does start to break apart a little if looked at too closely. The movie is a compelling, entertaining, and intelligent web of manipulation -- a dancing puppet, but we can see the strings, and if one squints real hard, even the gleeful hands of its smirking puppet master. 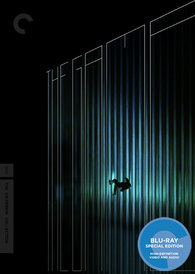 Criterion presents 'The Game' in their standard clear case with spine number 627. The BD-50 region A disc comes packaged with a booklet featuring an essay by critic David Sterritt. Having already been released on HD-DVD and foreign Blu-ray markets, 'The Game' makes its domestic Blu-ray debut with a 1080p/AVC MPEG-4 transfer in the 2.40:1 aspect ratio. I don't have any of those previous versions to make direct comparisons to, but by all accounts they were quite terrible, and thankfully this new transfer (supervised by cinematographer Harris Savides) appears to be a very nice upgrade. With that said, 'The Game' is still a comparatively soft and at times murky film, but this all seems to be in line with the director's intended visual style. The print is in great shape, with only a few fleeting specks here and there. A light layer of natural grain is preserved, giving the image a thin, filmic sheen. While detail is nicely resolved, clarity is actually fairly soft throughout, perhaps as a result of the filmmakers' frequent use of natural and practical lighting set-ups. Thankfully, the picture still carries a decent sense of dimension and texture. Colors are nicely saturated, but the film is often bathed in a blue or sickly yellow/green veneer. While not the most traditionally appealing palette, it fits the moody noir style well. Contrast is nicely balanced with intense but never blooming whites, offering some occasional pop. Like most David Fincher movies, this is an inherently dark film, and black levels are solid. With that said, they can be a little inconsistent, sometimes appearing nice and deep, and other times looking a bit light with muddy shadow detail. In the included special features, the cinematographer discusses his desire to limit artificial lighting in nighttime scenes, instead preferring night to actually look like night, and this decision might account for the occasional murkiness. While the film's style isn't always impressive, this is a seemingly authentic and respectful transfer. The image has some inherent softness, but that's simply the nature of the material. Fans should be very pleased with this release, and as far as I can tell, Criterion has done a nice job here. Criterion has provided two audio options. The first is an English DTS-HD MA 5.1 rendition of the movie's theatrical mix. The second is an English DTS-HD MA 5.1 track specifically designed for home theater use, dubbed the near field mix (originally designed for Criterion's Laser Disc release). As explained in the included booklet, the theatrical track retains the movie's original dynamic range while the near field mix features a lower dynamic range. This being the case, I opted to primarily listen to the theatrical mix, but did sample the near field track as well. Eerie and occasionally intense, the audio does a great job of complementing and enhancing the film's air of mystery and paranoia. Dialogue is clear, full and well prioritized. The mix carries a gloomy sense of atmosphere and space, spreading the film's moody score around the room. The front soundstage features nice separation and directionality, and while subdued, surround use is still implemented well. General city ambiance (bustling traffic, crowded restaurants) is dispersed effectively, and the rear speakers engage nicely during the film's more intense moments (a car accident and shootout, for instance). Dynamic range is wide, giving tiny, isolated sounds distinct fidelity, and aggressive noises (like gunshots) are given a loud, permeating kick. Bass activity is strong, with some powerful low end rumble in music cues and action scenes. The near field mix is comparable in sound design (though surround use might be a little more prominent), but features a smaller range with less variance between frequencies. When kept at the same decibel level, the near field track is much louder than the theatrical mix, but the dynamic range between quiet and loud moments is decreased. As the booklet states, it's more suitable for being played at lower volumes in small rooms. Tense and enveloping, the track does a good job of thrusting the audience into the film's dark, twisting world. In order to preserve the widest dynamic range, I recommend most viewers go with the theatrical mix, but both tracks are technically strong. Criterion has put together a nice collection of supplements, including a very informative commentary and some cool behind-the-scenes footage. All of the special features are presented in 1080p with Dolby Digital 2.0 audio and no subtitle options, unless noted otherwise. Audio Commentary with Filmmakers - Recorded separately, director David Fincher, screenwriters John Brancato & Michael Ferris, cinematographer Harris Savides, actor Michael Douglas, production designer Jeffrey Beecroft, and visual effects supervisor Kevin Haug provide commentary on the film. The participants all share a wealth of relevant production facts and sometimes fascinating insights into the movie's development. Details on sets, locations, themes, changes made to the script, stunts, effects, lighting, and virtually every other facet of the moviemaking process are addressed in-depth. Fincher spends a lot of time discussing the film's meta aspects and candidly elaborates on specific choices and his overall approach to directing. The participants' separate comments are all well edited together, and the track flows wonderfully. It's not the most lively commentary, but it's absolutely packed with trivia, anecdotes, and interesting technical information, making it a must listen for fans and budding filmmakers alike. Alternate Ending (HD, 1 min) - Presented with Dolby Digital 1.0 sound, this is a very brief and uneventful alternate ending. The filmmakers definitely made the right decision with the conclusion used in the movie. Film-To-Storyboard-Comparisons (HD) - Four split screen comparisons between storyboards and finished scenes are included. The sequences provided are "Dog Chase" (4 min), "The Taxi" (3 min), "Christine's House" (4 min), and "The Fall" (1 min). Behind the Scenes (HD) - Presented in upscaled 1080i, this is a collection of five separate behind the scenes featurettes, "Dog Chase" (4 min), "The Taxi" (12 min), "Christine's House" (5 min), "The Fall" (8 min), and "Location Footage" (9 min). Each segment is focused on a different set piece, and features lots of raw on-set footage showing how the stunts and effects were accomplished. Optional commentary with the filmmakers is also available, providing even more in depth information about the shoot, effects, cinematography, production design, and storyboarding process. Psychological Test Film (HD, 1 min) - Presented in 1080i, this is the bizarre CRS psychological test reel that's briefly featured in the movie. Teaser and Trailer (HD) - The film's teaser and trailer are included in 1080p. The teaser features optional commentary with digital animation supervisor Richard Baily who discusses the conception and execution of the unique CG work used. A render test of the teaser animation is also viewable with additional commentary by Baily. The theatrical trailer features optional commentary with David Fincher, who elaborates on the studio's marketing restrictions. 'The Game' is a twisting, faintly metafictional suspense film that takes its audience on a dark, paranoid journey down the rabbit hole. An exercise in layers of deceit, the film presents a compelling mystery, and a multifaceted commentary on cinematic logic and manipulation. Previous high-def releases have been disastrous, but this transfer appears to offer an authentic and respectful video presentation that should please fans. Criterion has provided two audio options, and both give audiences an effectively moody experience. The disc carries a very nice selection of supplements, including a great commentary track and some interesting behind the scenes footage. This is a film that has only improved with age, and thankfully Criterion has put together a very worthy release. Highly Recommended.